Nothing says you care like a beautifully decorated cake, and at Holland Farms Bakery & Deli, our cakes are extra special. That’s because they are never commercially prepared – like all of our baked goods, everything from the batter to the frosting are made from scratch in the Holland Farms kitchens. Do you have a special graduate you’d like to celebrate this month? A Holland Farms cake is the perfect way. We can customize the cake so that it is a beautiful, meaningful addition to your graduate’s party. And of course our cakes are simply delicious, so you know your graduation cake will be a hit with the guest of honor and everyone else! We can also fill our cakes – choose Bavarian cream, raspberry, strawberry, lemon or chocolate pudding. And, top it all off with either our buttercream or whipped cream frosting! Or if you’d prefer, we make delicious half moon and chocolate chip cookie cakes, too. And, we’ll decorate your cake just the way you want it, whether it’s for a graduation or other occasions like anniversaries, birthdays – you name it, we’ll make it. So give Holland Farms a call today at (315) 736-6044, and find out how we can make any occasion more memorable with one of our delectable cakes! Need a Graduation Cake? Holland Farms is at the Head of the Class! We know your favorite graduate is special to you, and you want their party to be perfect. At Holland Farms Bakery & Deli, we think our cakes are special, too. That’s because they are never commercially prepared – like all of our baked goods, everything from the batter to the frosting is made from scratch in the Holland Farms kitchen. So when you’re planning your party, don’t forget to order your graduate’s cake from us. It’ll make it special! We can also fill our cakes – choose Bavarian cream, raspberry, strawberry, lemon or chocolate pudding. And, top it all off with our buttercream, cream cheese or whipped cream frosting! And, we’ll decorate your cake just the way you want it – with your graduate’s favorite or school colors and a graduation cap – so that it’s perfect! So give Holland Farms a call today at (315) 736-6044 and find out how we can make your graduation party – and any occasion – more memorable with one of our delicious cakes! In recent years, the unassuming petite treats – cupcakes and muffins – have taken the spotlight. It seems that just about everyone loves them, and why not? They’re perfectly sized and can be personalized in virtually endless ways. That’s why Holland Farms Bakery & Deli has made May “Muffin and Cupcake Month”! Maybe you’re more of a cupcake person… no problem! You’ll enjoy delicious cupcakes made from the same homemade batter we use for our signature cakes – white, chocolate, carrot, red velvet – frosted with our buttercream, whipped cream or cream cheese frosting. Don’t miss out on muffins and cupcakes, all throughout the month of May – stop in to Holland Farms Bakery & Deli for a petite sweet treat today! St. Patrick’s Day is Delicious at Holland Farms! Here at Holland Farms Bakery & Deli, we think every day is a celebration – which is why we really pull out all the stops on holidays and special occasions! St. Patrick’s Day is no exception – we think you’ll enjoy our delicious offerings all through the month of March. For a traditional treat, try our Irish soda bread – made from scratch every day at Holland Farms. Pick some up in-store, or special order as many rounds as you need for your holiday get-together. And, we’re offering a wide array of our desserts, specially dressed in green for the holiday. You can choose from shamrock butter cookies, green half moons, green frosted donuts, as well as cakes and cupcakes specially decorated for St. Patrick’s festivities. Hungry for traditional St. Paddy’s fare? We’re offering our delicious corned beef and cabbage on St. Patrick’s Day, too. Stop in and enjoy some for lunch, or call ahead and order a dinner portion for the entire family. To order, call 315-736-6044 and speak with any of our smiling clerks. It’s easy to make your St. Patrick’s Day fun, memorable, and tasty, when you trust Holland Farms Bakery & Deli to do the cooking and baking for you! Mad for Half Moons? Don’t Miss March Moon Madness at Holland Farms! The half moon cookie is unique to our area – in fact, it originated right in Utica in the early part of the 20th century. Today, Holland Farms Bakery & Deli bakes some of the very best half moon cookies, fresh from scratch, every day. We’re so mad for half moons here at Holland Farms that we’ve declared March as Moon Madness Month. Of course, we offer the traditional chocolate half moon cookie frosted with half chocolate and half vanilla icing. And yes, we make the same cookie in vanilla. But we also know our customers have different tastes, and sometimes are looking for something a little bit out of the ordinary. Do you like chocolate with all chocolate icing? Vanilla with all vanilla icing? Raspberry jelly and coconut? What about a chocolate moon with vanilla swirled frosting… or a vanilla moon with chocolate swirled icing? Maybe you’d like carrot with cream cheese frosting… or perhaps red velvet? No problem. Holland Farms Bakery & Deli makes all of these varieties and what’s more, we dress them up special for holiday entertaining – pastels for Easter, green for St. Patrick’s Day, orange for Halloween. You can even special order colors for baby showers, bridal showers, school events – we make your moon just the way you want it, for any occasion. Don’t live in the area and miss the great taste of Holland Farms half moons? That’s no problem – give us a call at 315-736-6044, talk with any of our smiling clerks, and we’ll have half moons on their way to you in a jiffy. We mail our half moons priority mail on Mondays, Tuesdays and Wednesdays specially packaged to stay fresh, and you’ll receive them in 2 to 3 days. Or, you can order conveniently online, and we’ll contact you with payment and shipping details. Don’t miss out on March Moon Madness, happening right now at Holland Farms Bakery & Deli! Hey Cupcake! Albro’s Tasty Treats are a Holland Farms Standout! When you stop into Holland Farms Bakery & Deli, one thing you’re sure to notice right away is our display case filled with beautifully decorated cakes, cupcakes and treats. Behind these designs is Sheila Albro, lead cake decorator at Holland Farms. Sheila has worked at Holland Farms for two and a half years, but she’s been decorating cakes for more than 12 years. “My mom and sister are both cake decorators, so I grew up with it,” Sheila said. As part of her responsibilities at Holland Farms, Sheila works directly with clients to help them create the custom cake of their dreams, as well as creating numerous cake and cupcake designs which are sold daily in the bakery case. It’s Freezing Out! Warm Up at Holland Farms With a Hot Cuppa Joe! There’s nothing like a steaming hot cup of coffee on a cold winter morning. When you choose Holland Farms for that morning cup of joe, you’ll be treated to our amazing gourmet coffees, brewed fresh all day long. Our private roast of Paul deLima coffee, the frequency with which we brew, and our super-clean coffee machines ensure that you get a delicious cup of coffee to start your day. Or, try a hot chocolate, hot tea or a French vanilla cappuccino. Our coffee is always hot, fresh and served with real half & half cream. Like it light? Have it with milk or skim milk. Like it dark? Try our fresh brewed Midnight Blend. Like it flavored? Ask for fresh brewed Paul de Lima’s Hazelnut or French Vanilla or add a flavored creamer. However you like your coffee, when our smiling clerks see you coming they’ll have your order ready for you, steaming hot and ready to go. This month, we’re also pleased to introduce our brand-new insulated mugs. These red mugs feature our Holland Farms logo, and are perfect for a cuppa joe on the go! And, Holland Farms coffee has been voted Best of the Best many times by the Observer-Dispatch’s readers – so stop in today for a warm up of Mohawk Valley’s best brew! And don’t miss out on our January coffee special – on Mondays, you can pick up a cup, any size, for only $1! Soup’s On – and So Is Lunch! Let Holland Farms Deli Items Warm You! When the temperatures outside turn colder, Holland Farms turns up the heat in our deli, offering delicious hot soups and lunch specials that are sure to warm you from the inside out. And, we have delicious hot lunch specials available on a daily basis as well. You can choose from tasty entrees like macaroni & cheese, meatloaf & mashed potatoes, Spanish rice and turkey pot pie, to name just a few. So stop into Holland Farms Bakery & Deli and warm up today – you’ll be glad you did. Good things come in small packages, and at Holland Farms Bakery & Deli, we’re making picking up a small treat (or two) even easier in January. That’s because we’ve put all of our cupcakes on special this month. All throughout the month enjoy our small cupcakes for 69¢ each or 6/$3.99; or take home some of our large cupcakes for $1.59 each or 6/$8.99. 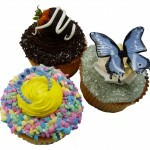 Not to mention, the special sale price applies to our clever cakes made out of artfully placed cupcakes (by order only). And, this month we’re offering a new frosting flavor – berry souffle made by combining our delicious traditional buttercream frosting with real berry puree. Additionally, you can get cupcakes filled with our Boston cream filling, our buttercream, or various fruit fillings. We’re always up for a challenge – if you don’t see a particular cupcake that piques your interest, let us know, and we’ll do our best to create one for you. Give us a call for larger orders or specific flavors. Our cupcakes are perfect for just about any occasion – birthday parties, weddings, anniversaries, baby or bridal showers, or no occasion at all! So stop into Holland Farms this month for a small treat! Ingrid S. — Love Holland Farms. My favorites are the tomato pie of course and moon pies. Everything I’ve tried there I liked. Also like their greens. It’s a must stop every time we go to Utica.